In this age of television, where even the most gruesome police drama ends with warm and fuzzies, Zach Fortier turns that notion on its head with his gritty and often dark glimpse into the life of a true crime fighter. CurbChek Reload is more than a disturbing post-mortem on a career that spanned several decades; it is a clinical and sometimes humorous look into the underbelly of society. The book is presented in small vignettes of his calls throughout the years and his interactions with other officers, informants, and the general public. This isn’t the story of one case that has stuck with Fortier over the years, but rather the everyday nuts and bolts of being an officer on the beat. Just like most lifelong police officers, Fortier displays the trademark egotism that is part and parcel of making life and death decisions. 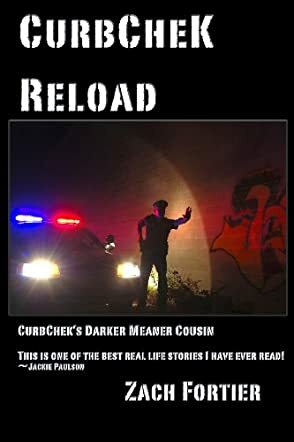 CurbChek Reload is a true crime tale that is both gruesome, heartbreaking, and true to his law and order roots. Zach Fortier has but one primary emotion about all of this: anger. His anger is understandable, but the average civilian will not be able to read the crimes he’s worked without a healthy dose of sadness, disgust, and happiness that a guy like Fortier was there with his gallows humor to get the job done. He does a great job of simply “telling it like it is,” without a lot of sugarcoating or embellishments, because true crime is enough on its own with extra blood, guts, or victims. After reading this installment of CurbChek, those old episodes of Law & Order won’t be nearly as satisfying!